Words from Barack Obama? Hardly. Those are words from Franklin Roosevelt’s first inaugural address. I am disappointed in my president, our president. “I don’t think” indicates an Obama-centric view of the financial turmoil of Americans — not a “people centric” view. And by guessing at what Americans really do fear, “financial institution,” Obama is saying it is these evil “financial institutions” that many of us do fear. Well, maybe in Obama World and Obama’s White House, people fear financial institutions because they have no understanding of capitalism, business, the stock market and the American dream. I am afraid that President Obama has no clue….That’s my fear. And I resent Him telling me what I think. I am afraid now because President Obama, Nancy Pelosi, Harry Reid and a lot of other well meaning folks think the government is the solution. America’s founders wrote down the Declaration of Independence, the Constitution and the other parts of our national fabric because they were living in fear of a far off all knowing and uncaring English Government. And their spirit lives today in the saying, “I’m from the government and I’m here to help.” Many of us fear such naive, ignorant hubris. I am starting to fear Washington. Obama’s Washington. A far off, all knowing and uncaring government about five miles from my house, which is surrounded by other foreclosed houses. I really do fear that Obama and many Democrat’s don’t get it. And I thought he went to Harvard. There is no “profit earnings ratio.” There is a “price to earnings ratio” or PE. Investors care more about their return on the dollar, reflected in the price they paid and the earnings that resulted. I was even more disappointed when the president repeated this ignorant flub in a New York Times interview late in the week. That meant to me that nobody in the White House was smart enough to straighten out the president by holding a little school call on him. Or maybe they just don’t know; and don’t read. They certainly don’t listen. But they’re thinking about curing all my education and health care problems, undoutedly…. So Obama’s lack of stock market lingo doesn’t mean to me that he slept through high school: it means he has no idea what drives capitalism because he was reading socialist doctrine instead of paying attention to America, as he himself indicates in his books. Maybe he never invested in anything but himself. It seems to us that the attacks on Rush Limbaugh fromTeam Obama are an effort to tell Americans what to think and what not to think. This kind of arrogance often manifests itself in unusal ways: Limbaugh’s radio show ratings doubled. So I really do fear that President Obama and his guys don’t get it…. I fear that the president doesn’t understand that many of us don’t want to pay more taxes, however they are hidden or veiled and whatever thay are for, many of us DO MIND paying for por, even though Chick Schumer thinks we don’t, and many of DO want to further understanding of the good news/bad news behind such huge spending on health care and other Obama projects. And I certainly DO WANT to understand how all this government debt will degrade American growth and quality of life in the future. I don’t like sending money for oil to Saudi Arabia and I don’t like sending debt/interst payments to China eaither…. WASHINGTON (AP) — President Barack Obama offered his domestic-policy proposals as a “break from a troubled past.” But the economic outlook now is more troubled than it was even in January, despite Obama’s bold rhetoric and commitment of more trillions of dollars. And while his personal popularity remains high, some economists and lawmakers are beginning to question whether Obama’s agenda of increased government activism is helping, or hurting, by sowing uncertainty among businesses, investors and consumers that could prolong the recession. Although the administration likes to say it “inherited” the recession and trillion-dollar deficits, the economic wreckage has worsened on Obama’s still-young watch. Every day, the economy is becoming more and more an Obama economy. More than 4 million jobs have been lost since the recession began in December 2007 — roughly half in the past three months. Stocks have tumbled to levels not seen since 1997. They are down more than 50 percent from their 2007 highs and 20 percent since Obama’s inauguration. The president’s suggestion that it was a good time for investors with “a long-term perspective” to buy stocks may have been intended to help lift battered markets. But a big sell-off followed. Presidents usually don’t talk about the stock market. But the dynamics are different now. A higher percentage of people have more direct exposure to stocks — including through 401(k) and other retirement plans — than ever. So a tumbling stock market is adding to the national angst as households see the value of their investments and homes plunge as job losses keep rising. Some once mighty companies such as General Motors and Citigroup are little more than penny stocks. Many health care stocks are down because of fears of new government restrictions and mandates as part a health care overhaul. Private student loan providers were pounded because of the increased government lending role proposed by Obama. Industries that use oil and other carbon-based fuels are being shunned, apparently in part because of Obama’s proposal for fees on greenhouse-gas polluters. Makers of heavy road-building and other construction equipment have taken a hit, partly because of expectations of fewer public works jobs here and globally than first anticipated. “We’ve got a lot of scared investors and business people. I think the uncertainty is a real killer here,” said Chris Edwards, director of fiscal policy for the libertarian Cato Institute. Some Democrats, worried over where Obama is headed, are suggesting he has yet to match his call for “bold action and big ideas” with deeds. In particular, they point to bumpy efforts to fix the financial system under Treasury Secretary Timothy Geithner. Obama may have contributed to the national anxiety by first warning of “catastrophe” if his stimulus plan was not passed and in setting high expectations for Geithner. Instead, Geithner’s public performance has been halting and he’s been challenged by lawmakers of both parties. Republicans and even some top Democrats, including Rep. Charles Rangel, D-N.Y., chairman of the House Ways and Means Committee, have questioned the wisdom of Obama’s proposal to limit tax deductions for higher-income people on mortgage interest and charitable contributions. Charities have strongly protested, saying times already are tough enough for them. The administration suggests it might back off that one. Even White House claims that its policies will “create” or “save” 3.5 million jobs have been questioned by Democratic supporters. “You created a situation where you cannot be wrong,” the chairman of the Senate Finance Committee, Montana Democrat Max Baucus, told Geithner last week. Republicans assert that Obama’s proposals, including the “cap and trade” fees on polluters to combat global warming, would raise taxes during a recession that could touch everyone. “Herbert Hoover tried it, and we all know where that led,” says House Republican leader John Boehner of Ohio. The administration argues its tax increases for the households earning over $250,000 a year and fees on carbon polluters contained in its budget won’t kick in until 2011-2012, when it forecasts the economy will have fully recovered. But even those assumptions are challenged as too rosy by many private forecasters and some Democratic lawmakers. Many deficit hawks also worry that the trillions of federal dollars being doled out by the administration, Congress and the Federal Reserve could sow the seeds of inflation down the road, whether the measures succeed in taming the recession or not. The money includes Obama’s $3.6 trillion budget and the $837 billion stimulus package he signed last month. Polls show that Obama’s personal approval ratings, generally holding in the high 60s, remain greater than support for his specific policies. Allan Sinai, chief global economist for Decision Economics, a Boston-area consulting firm, said the complexity and enormity of the crisis make it hard to solve. “Lincoln and Obama shared a loved of words, a belief that rhetoric and oratory could change people’s minds, and the way they would express things, the confidence they would have in a debate – not by fiery oratory, but by a calming presence, a reasoned argument,” says Rice University History Professor Douglas Brinkley. With Lincoln often ranking atop historians’ surveys of the greatest U.S. presidents, who wouldn’t want the “Lincolnesque” moniker applied to them? Obama’s circle goes further in portraying him as also fulfilling the legacies of John F. Kennedy and Martin Luther King. As Brinkley sees it, a better analogy lies between Obama and Franklin Roosevelt, who inherited the Great Depression or Lyndon Johnson, who launched the Great Society programs. The Lincoln inspiration, Brinkley says, is nothing new. “All Presidents walk the corridor and think about Lincoln. They stare at his portrait. Richard Nixon used to drink gin and have the Secret Service take him to the Lincoln Memorial at night just to talk to Lincoln’s statue,” Brinkley says. Theodore Roosevelt wore a lock of Lincoln’s hair in a ring on his finger. “We don’t realize how hard it is to be President and how lonely it is in the White House,” Brinkley says, especially when rebel troops are occupying Maryland and Virginia. 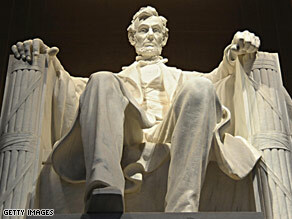 Obama Reaching Too Much Toward Lincoln? Obama And The Press: What’s The Future? The spirit of Abraham Lincoln will suffuse Tuesday’s inauguration day, as Barack Obama channels the example of America’s greatest president for a national struggle to overcome the trials of today. From the Bible that Obama intends to use at his swearing-in to the food he will eat afterwards, the 44th president is overtly invoking his illustrious predecessor in an audacious grasp at history’s inspiration. “The comparisons to Lincoln, which he has not run away from, set up a high standard, particularly for Americans who don’t really follow politics,” Princeton University presidential historian Julian Zelizer said. “I think his goals are threefold: first to connect himself with a great leader; second, to place himself in a broader narrative about the nation overcoming its racial past; and third, about being a leader who can heal divisions in difficult times,” he said. In the 200th anniversary of Lincoln’s birth, Obama is reaching back to another lanky lawyer from Illinois who surmounted doubts about his political inexperience to win the presidency at a time of the greatest crisis. President from 1861 to 1865, Lincoln steered the north to victory over the rebel south in the Civil War, abolished slavery and handed down some of the most inspirational oratory of US history. His adroitly managed administration was a “team of rivals” drawn from his competitors for the Republican nomination, an example that the Democratic Obama has emulated in naming Hillary Clinton to his cabinet as secretary of state. In his books and speeches, Obama has described Lincoln as his political hero. He launched his quest to become America’s first black president from the steps of the Illinois state legislature, where Lincoln also served. There is a risk of rhetorical over-reach as the untested Obama takes office with the economy deep in crisis and US troops engaged in two wars. But he is not shying away from the comparison, re-reading Lincoln as he hones his own inaugural address. “You know, there’s a genius to Lincoln that is not going to be matched,” he said in an ABC television interview, claiming to be “intimidated” at the power of Lincoln’s second inaugural address. And intimidated or not, Obama was funneling the Lincoln example en route to the inauguration, on Saturday retracing his predecessor’s train journey into Washington from Philadelphia and Baltimore. Obama was Sunday beginning the official inaugural festivities with a public event at the imposing Lincoln Memorial, at the far end of the National Mall from Congress, where he will be sworn in Tuesday. For that occasion, in front of a crowd expected by city authorities to number millions, Obama will rest his left hand on Lincoln’s own Bible — borrowed from the Library of Congress — to take the oath of office. Afterwards, Obama will sit down for lunch with congressional leaders, Supreme Court justices and members of his incoming cabinet to eat the kinds of food enjoyed by Lincoln. The VIP guests will dine on seafood stew, wild game, root vegetables and apple cake off a replica service of the china set selected by Lincoln’s wife at the start of his presidency. But perhaps just as well, one Washington site intimately connected to Lincoln will not figure in Obama’s celebration. Ford’s Theatre, where the 16th president was assassinated, is closed for renovation.